Book your Abu Dhabi flights with Rehlat and explore a destination which is enchanting and glamorous and has a fascinating past. It’s the proud capital of UAE and till date has maintained the ancient traditions but has also stepped forward with the modern charm. Once you get your Abu Dhabi flights booked, you will fall short of time with the numerous activities available. Shopping and sightseeing will take up your visit time. Hurry, get your Abu Dhabi flights booked early with amazing deals and exciting discounts at Rehlat. Abu Dhabi has turned into a bustling, modern city with broad boulevards, high-rise buildings, gleaming skyscrapers, and bustling shopping malls. Monuments such as The Sheikh Zayed Grand Mosque, the Heritage Village, and Qasr Al Hosn add to the city’s historical charm whereas the Capital Gate and the Yas Island are the recent developments. Shopping is one of the major attractions for the people visiting Abu Dhabi. A wide variety of entertainment like theaters, game zones, cinema, food court, and kids play area along with ample parking space is provided by the malls. Abu Dhabi malls provide a variety of products, clothing, electronics, jewelry, sports types of equipment, food items, gift articles, household products, toys etc. Away from the skyscrapers and other man-made wonders, Abu Dhabi has a captivating history and a number of magnificent cultural attractions. 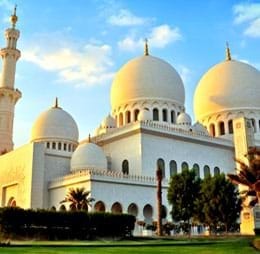 Elegant and serene and with a backdrop of purest blue, cloudless skies, the Sheikh Zayed Grand Mosque is the wonderful manifestation of Abu Dhabi’s cultural ambitions. Abu Dhabi celebrates many festivals and events in addition to their traditional festivals such as Ramadan, Eid Al Adha, Eid ul-Fitr, etc. In fact, Ramadan and Eid Al Fitr are the main festivals celebrated in entire UAE. Eid Al Fitr followed by Ramadan is a three-day festival celebrated with family prayers. Buses, cars, taxis are the most regularly used mode of transportation in Abu Dhabi. Taxis are a great way to travel around the city and fairly cheap. The main bus complex is on Hazza Bin Zayed Road. Guests can check in here before they fly. The terminal has a lounge and convenient transport facilities. Once done with check in at the City Terminal, travelers can arrive at the airport just an hour before their flight departs. The transport facility to and from the airport is through taxis, public buses, and complimentary shuttle services provided by hotels. Abu Dhabi boasts of several budget hotels and has many state-of-the-art 5-star luxury hotels that offer an engaging environment and exceptional culinary experiences to their guests. Apart from a host of contemporary amenities like fitness centers, Wi-Fi, bed and breakfast benefits, most of the Abu Dhabi Hotels have world-class hospitality combined with scenic outside views to delight the guests.